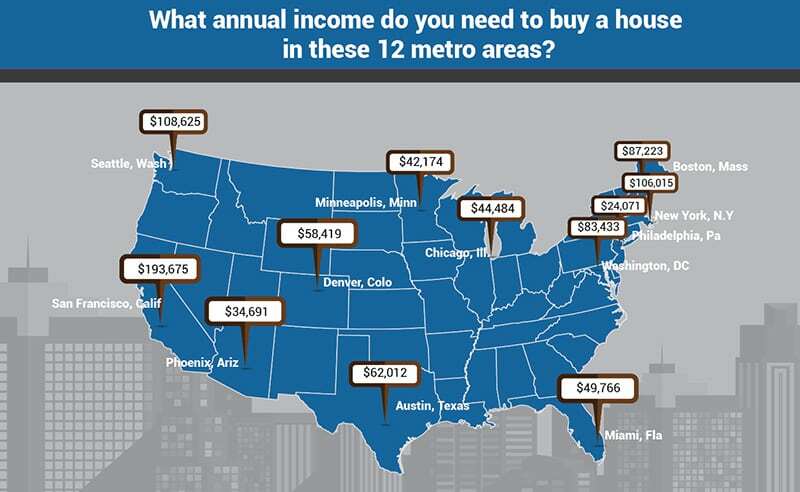 Can You Afford To Live in These 12 Metro Areas? How Much Can You Expect to Spend on a Mortgage in These 12 Metro Areas? With home prices rising around the country, it’s interesting to wonder just how much you need to buy – and keep – a home in some of the largest metro areas. A recent analysis of different housing markets around the nation showed what the median price of homes was in that city, as well as how much a downpayment would be, the cost of calculated monthly payments and the income you would need to keep the home. Here are 12 of the largest markets and what you would need to be able to afford a home in the area. Can you afford to buy a home in any of these cities? With some of these markets being barely affordable for most people, it’s fair to wonder where you can find affordable housing. Many home buyers, especially first time home buyers, have been using special mortgage programs to afford a house. For example, the USDA home loan allows buyers to purchase a home in designated rural areas without requiring any downpayment. These rural areas often include the suburbs of many of the cities mentioned in this study. Other home buying programs are available as well, such as low-income mortgages. 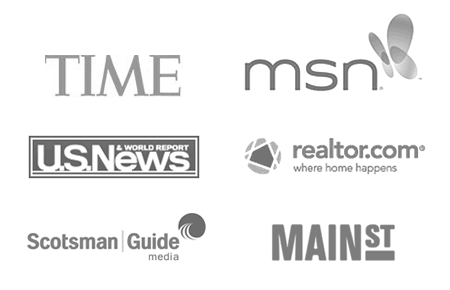 Click to see if you’re eligible for special mortgage programs. We calculated each downpayment rate starting with a median home price, data found on Zillow. Property tax, county data from Census Bureau’s American Community Survey (ACS). We used a 36% front-end debt ratio based on the median home price data and property tax. We calculated based on 20% downpayment (excluding PMI). With 20% down, a homeowner could expect to pay about $722 per month including principal, interest, home insurance and property tax. A minimum qualifying income, using the 36% front-end ratio, is $24,071. With 20% down, a homeowner could expect to pay about $1,041 per month including principal, interest, home insurance and property tax. A minimum qualifying income, using the 36% front-end ratio, is $34,691. With 20% down, a homeowner could expect to pay about $1,335 per month including principal, interest, home insurance and property tax. A minimum qualifying income, using the 36% front-end ratio, is $44,484. With 20% down, a homeowner could expect to pay about $1,265 per month including principal, interest, home insurance and property tax. A minimum qualifying income, using the 36% front-end ratio, is $42,174. With 20% down, a homeowner could expect to pay about $1,493 per month including principal, interest, home insurance and property tax. A minimum qualifying income, using the 36% front-end ratio, is $49,766. With 20% down, a homeowner could expect to pay about $1,860 per month including principal, interest, home insurance and property tax. A minimum qualifying income, using the 36% front-end ratio, is $62,012. With 20% down, a homeowner could expect to pay about $1,753 per month including principal, interest, home insurance and property tax. A minimum qualifying income, using the 36% front-end ratio, is $58,419. With 20% down, a homeowner could expect to pay about $2,503 per month including principal, interest, home insurance and property tax. A minimum qualifying income, using the 36% front-end ratio, is $83,433. With 20% down, a homeowner could expect to pay about $2,617 per month including principal, interest, home insurance and property tax. A minimum qualifying income, using the 36% front-end ratio, is $87,223. With 20% down, a homeowner could expect to pay about $3,181 per month including principal, interest, home insurance and property tax. A minimum qualifying income, using the 36% front-end ratio, is $106,015. With 20% down, a homeowner could expect to pay about $3,259 per month including principal, interest, home insurance and property tax. A minimum qualifying income, using the 36% front-end ratio, is $108,625. With 20% down, a homeowner could expect to pay about $5,810 per month including principal, interest, home insurance and property tax. A minimum qualifying income, using the 36% front-end ratio, is $193,675.